Last Saturday I participated in a special kind of 10k. It wasn't the typical 10k where you have a timing mat, volunteers, and winners. In this case, the winners are all of the participants, Operation Jack, and Train4Autism. We had a one person cheer squad/photographer, Patti, Jim's wife who braved the cold weather. There were 8 runners and for the most part, we ran in two small groups. In this case, I got to run with my running girl, Stacy (yay! ), Michelle, Sarah, Donna and her friend (sorry, I don't know her name), Danielle (who is 20 weeks pregnant), and Jim. This was my first time meeting Jim, my Daily Mile friend, and his wife. I really hope we have more opportunities to meet again in the future. The both of them are the nicest people ever. 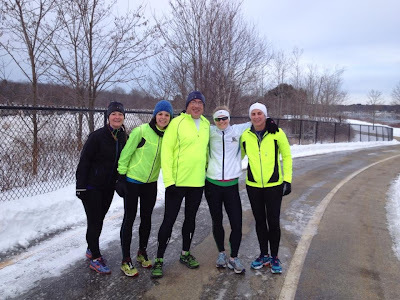 We met up in the parking lot on the bike path in Brunswick at 8am, Saturday morning. It was cold, 13F, and we had just gotten 10+ inches of snow the day before. Thankfully the bike path is managed by the Brunswick Parks and Recreation so the path was plowed. There were only a few icy spots on the path and considering the amount of snow we received, I am impressed there were only those few spots. Sure, I paid a registration fee for the run. And I know I can run with a group of friends for free, but the benefactor of the run is well worth the registration fee. 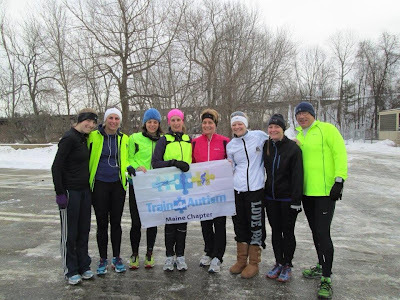 In this case, Team Maine raised $350 for Train 4 Autism. there's always time for a photo op mid run, don't you think? 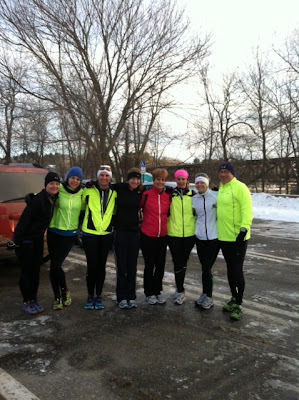 When all of us finished running, we gathered for a Team Maine - Train 4 Autism picture, then headed off to Mr. Bagel, a local bagel shop for coffee, bagels, laughs, and awards. In this case, our organizer, Sarah, reached out to several fabulous companies for prizes and received some amazing donations. Donations were made by ProCompression, Mile 22, Oiselle, My Happy Pace, Erica Sara, and Brooks. 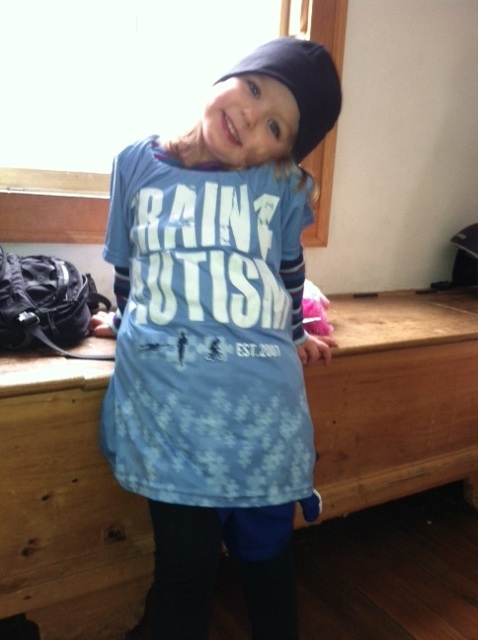 Train 4 Autism even sent tech shirts. Of course, mine was stolen borrowed by my little runner girl who was "racing" around the house in daddy's running hat, shorts, and her leggings when I got home. In this case, every single one of the runners on Saturday walked away with an awesome prize. I won an Oiselle Rundelicious top. My first (and not last) article of Oiselle clothing. After wearing this shirt, I now understand why everyone raves about Oiselle. A Little Background Information about Operation Jack and Train 4 Autism. Operation Jack was founded by Sam, the father of Jack, a child with Autism. Funds raised by Operation Jack are contributed to Train 4 Autism, a national organization that raises money for Autism charities. You can read more about Jack, Sam, and Operation Jack here. 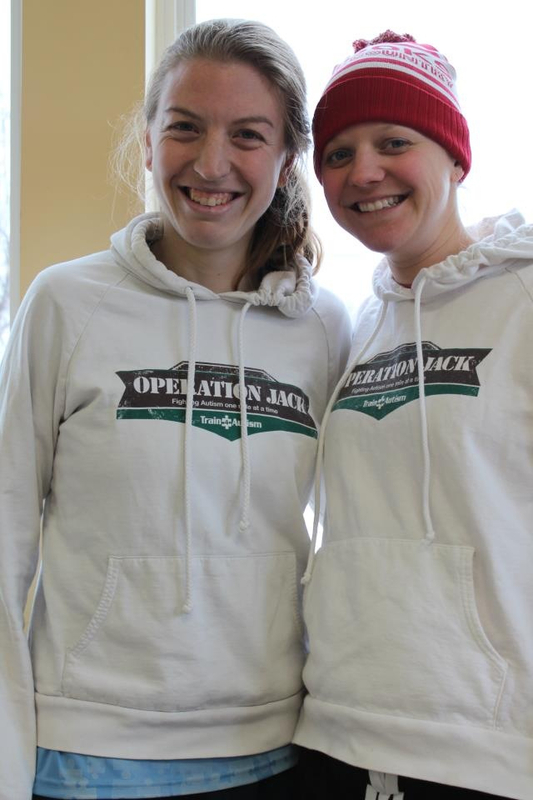 Operation Jack held a marathon and half marathon on December 26th in Los Angeles, CA. 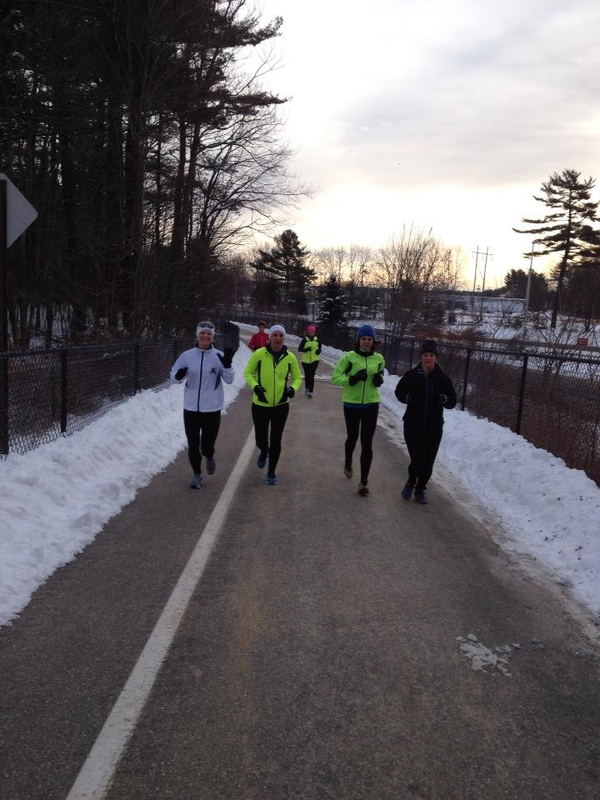 In addition, the satellite runs took place in Maine, Oregon, and Kansas and they were held on December 29th. In all, there were close to 600 participants nationwide and more than $45,000 was raised to benefit Train 4 Autism. Thank you, Sarah, Operation Jack, and Train 4 Autism for this amazing run. I am definitely going to be adding this run to my yearly running bucket list. Brrrr. Good for you for running for a great cause:) Sounds like a great time! Looks cold out, but what a great cause. Nice prizes too! What a beautiful and amazing gesture! I love it! In the next few weeks, I am launching a virtual run for my best friends son who has Cancer. I hope it goes as well. Congratulations! Sounds way cold, but always nice to run for a good cause (and for schweet schwag!). Great way to start the year! So wish I could have been there and I'm jealous of your prize! Great recap! It's a great cause and I wish I lived closer to Maine so I could run in the satellite run with you all! Congratulations on winning the Oiselle top and for running this virtual race!